Fully Responsive â€“ Looks equally good on all screen sizes! 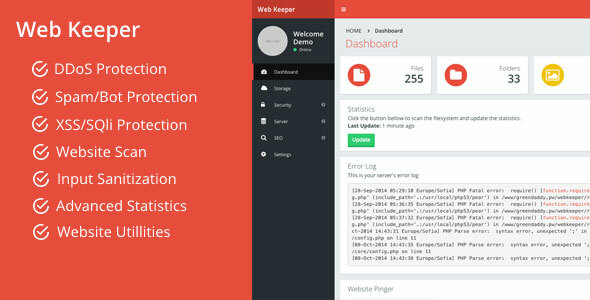 Website Scan â€“ Scan your website for junk files, shells and other potential threats. Automatically clean up junk files, remove shells and other threats, receive personalized suggestions on how to improve your website. Personalized Suggestions â€“ After scanning your website, you will be given personalized suggestions on how to improve it. DDoS Protection â€“ The most effective way to handle DDoS attacks, automatically forces Apache to block the attackers. All ddos attacks get logged and can easily be reviewed.